To return to our story, one day Sigmund and Sinfjoti, while out robbing, come upon a house “where two men were sleeping who wore thick golden rings.” We are told that these men were princes (literally “king’s sons,” konungasynir) who had “suffered an evil fate.” Wolfskins (úlfahamir) hung over them. “They could only come out of the wolfskins every tenth day.”  Sigmund and Sinfjotli put on the wolfskins and find that they cannot remove them. Their voices become wolf howls, but they are able to understand each other. 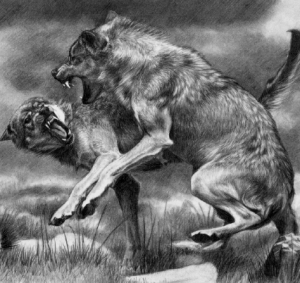 Kershaw notes that “The werewolf life is part of the training of the young warrior throughout the [Indo-European] world.”  Here, Kershaw means that it was common for young warriors to identify with the wolf. This identification, furthermore, may have been very literal – in other words, young warriors could have believed that they took on the spirit of the wolf, and were to some degree transformed into wolves. In the Norse tradition, such warriors were identified, of course, as the úlfheðnar (approximately, “those wearing a wolf cloak”). 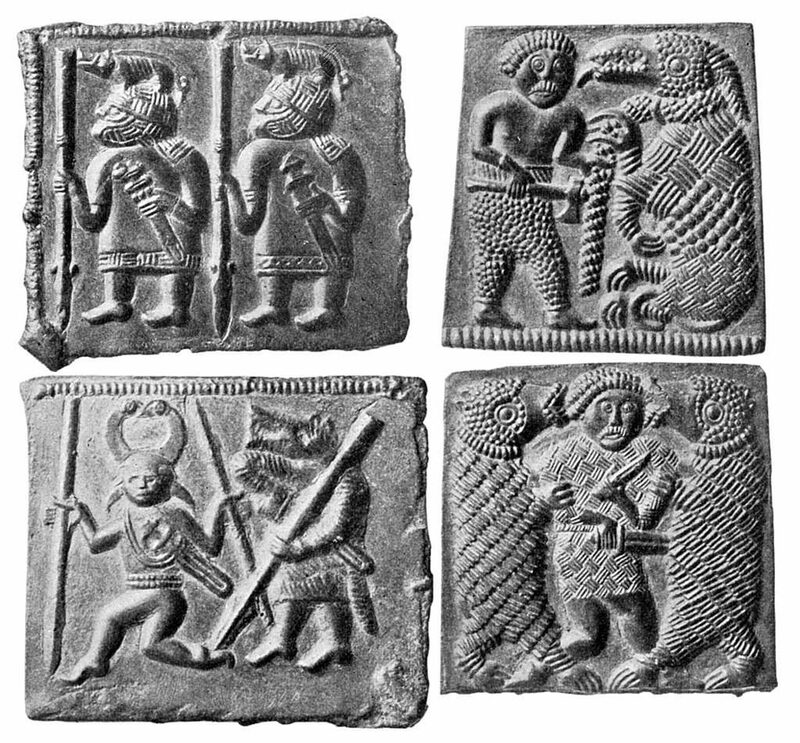 There are references to the úlfheðnar in several sagas, and one of the Torslunda plates (sixth/seventh century) depicts what seems to be an úlfheðinn. These “werewolf warriors” were consecrated to Odin, and Kershaw argues for an interpretation of the god as “leader of an army of ecstatic wolf-warriors.”  Kershaw is here drawing on the work of Otto Höfler, who “explained the many facets of this ‘most multiform’ of gods by deriving them all from his role as god of the ecstatic warrior brotherhoods.”  Kershaw translates Óðr as ekstasis, a practice I have defended in a number of essays, in which I have discussed the concept of ekstasis at length. In brief, an ecstatic state is one in which we “stand outside ourselves”; one in which we are transported beyond the ordinary level of our existence and feel transformed and inspired. Note that this mentions that the shapeshifter lay as if he were asleep or dead. And what do we find in the Volsung Saga? The princes are found asleep in their beds, with the úlfahamir (wolf skins) “hanging above them.” Recall that we are never told who these two princes are, or why they have suffered an “evil fate.” It is entirely possible that this is, as Lecouteux suggests, a garbled recollection of an older version of the story in which the princes are asleep because they are projecting their “skins.”  But why would the story have been so greatly changed? Why would an internal “skin” have become an external one? Lecouteux discusses how Christianity sought to stamp out the pagan belief in a soul containing more than one hamr, and literalized accounts of lycanthropy (or other forms of shapeshifting) as involving “putting on skins.” Lecouteux offers multiple examples of this, saying of the trial transcript of one man accused of being a werewolf, “There is no longer a question of a body in lethargy, and metamorphosis is here replaced by a wolf garment.”  If this hypothesis is correct, I would suggest further that the “princes,” in older versions of the tale, were probably Sigmund and Sinfjotli themselves – both of whom are of royal blood, of course, and who certainly have “suffered an evil fate,” at the hands of Siggeir. The werewolf episode may thus have originally involved Sigmund and Sinfjotli lying down in their beds and shapeshifting through the projection of a hamr in wolf form. Furthermore, it may be that the episode originally involved Sigmund teaching Sinfjotli how to shapeshift into the form of the wolf, as a deliberate part of his training (as opposed to how the saga writer presents the discovery of the “wolfskins” as happenstance). In any case, once Sigmund and Sinfjotli have transformed into wolves, they decide to go their separate ways, at least for a while. Before doing so, they make an agreement that, while alone, they will attack no more than seven men at a time. If they should encounter a larger group, they agree to call to the other for help. At this point, we should note the obvious: that the pair are no longer engaged in the activity of robbing men, but solely in slaughtering them. And, we might add, eating them and drinking their blood. In Helgakvitha Hundingsbana I, stanza 36, in the Poetic Edda, Sinfjotli is attacked by his opponent Guthmund with a series of accusations, amongst which is “You have eaten dead men’s flesh . . . your cold mouth has often sucked wounds.”  This seems clearly to be a reference to Sinfjotli’s time as a werewolf. Kershaw notes, in addition, that “[d]rinking blood and eating raw meat were reputed to make warriors fierce and formed a standard part of the education of the adolescent Männerbündler.”  This is yet another reason to think that, originally, the werewolf episode was orchestrated by Sigmund as part of Sinfjotli’s training. See in particular my essays “The Gifts of Ódhinn and His Brothers ” and “The Stones Cry Out ” in What is a Rune? And Other Essays  (San Francisco: Counter-Currents Publishing, 2015).